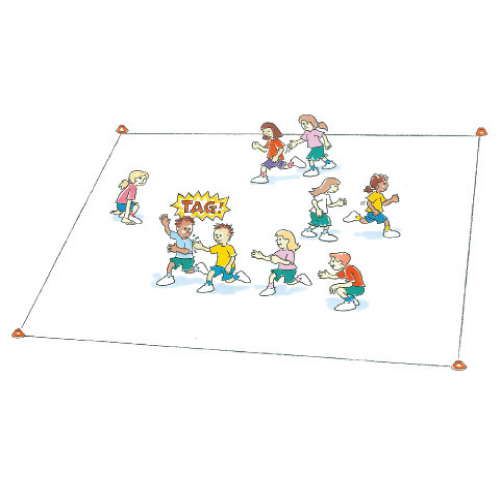 Octopus is an energiser or warm-up that requires players to avoid being tagged whilst running along the lines. Players line up along one side of the diamond. 1 player is chosen to be ‘IT’ and stands in the middle of the field. When ‘IT’ calls ‘OCTOPUS’, players run from one side of the field to the other trying not to get tagged. If tagged, players must freeze but can assist by tagging players by moving only their arms. Continue until 1 person remains untagged. Look for ways for players who are tagged early to return to the game quickly. Ask both chasers and runners to work together to come up with a successful strategy. Would it be easier if the playing area was smaller? How can the ‘IT’ player tag more players?